Pattern Blocks and Transformation Tools is an Etoys project to provide teachers and learners a simple free tool to explore ideas using Pattern Blocks. 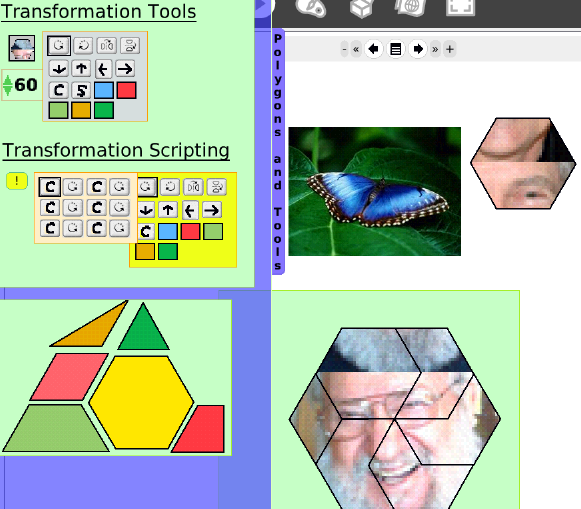 The transformation tools also allow kids to create their own transformation scripts by simply dropping the transformation tiles into a Etoys holder. There is also a "Guess Who I Am" game on Page 2 where kids can create their own version of the game by dragging in or creating pictures and embedding them in the Polygons. If you can recommend any others please let me know. Develop understanding of fractions as parts of unit wholes, as parts of a collection, as locations on number lines, and as divisions of whole numbers. Recognize and generate equivalent forms of commonly used fractions, decimals, and percents. Use models, benchmarks, and equivalent forms to judge the size of fractions. Represent and analyze patterns and functions, using words, tables, and graphs. Describe, extend, and make generalizations about geometric and numeric patterns. Make and test conjectures about geometric properties and relationships and develop logical arguments to justify conclusions. Investigate, describe, and reason about the results of subdividing, combining, and transforming shapes. Build and draw geometric objects.